I wonder how many audiophiles get caught on the “power escalator,” by which I do not mean the one at the mall, but the one in the listening room. Did you know you have an escalator in your audio room? Sure you do, if you have over time found yourself seeking an ever more powerful amp which you believe will yield better sound. I admit I have a very tall, long escalator in my room, one that extends back ten years and reaches 1,000 Watts high! I rode that escalator many times between the 200-Watt and 1,000-Watt floors, but it has been several years since I rode it down to the basement, the sub-100-Watt floor. With the review of the First Watt J2 JFET Amplifier and B1 Buffer Amp, it is time to descend. It seems most audiophiles enter the hobby already well upward from the bottom steps of power by using either a receiver with at least 100Wpc or separates at the same, or higher, specification. It did not take me long to settle on enjoyment of big power. Among several others, I have reviewed two powerful amps from Pass Labs, the Class A XA160.5, and the Class A/B X600.5. I must admit that for all the beauty of the XA160.5 I felt drawn to the X600.5 for the vastness of the soundstage, the macrodynamic impact and utter ease at higher listening levels. I concluded I could capture the finesse the XA160.5 displayed through manipulating other aspects of the system such as the DAC or cables. However, the attributes provided by the power structure of the X600.5 seemed impossible to duplicate with the lower-powered amp. I have spent a fair bit of time, too, with Class D amps offering from 200 to 1,000Wpc, another flavor of big sound. To date, the Red Dragon S500 is my Class D amp of choice, and it has been a particularly peachy performer with sultry sound in many systems. Given these experiences, what could possibly enthrall about a (relatively) puny “25 Watter” by First Watt? That is what I seek to explain in this article, along with my impressions of the difference between big power and relatively low power, and the practical implications for someone going the lower-power route. 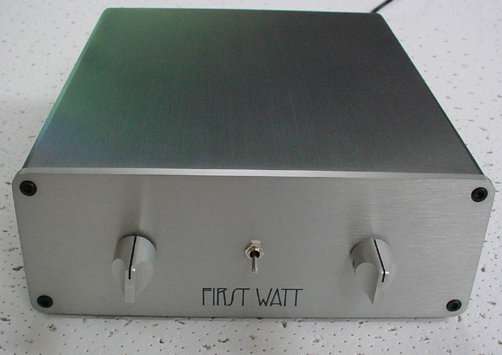 The B1 Buffer Preamp is described by First Watt as a minimalist line stage for controlling listening levels without editorializing on the source signal. It is a small, lightweight but well built, pressed all-aluminum box featuring a center toggle switch on the faceplate to select between two pair of RCA inputs, and twin attenuation controls for Left and Right channels. On the backside, the unit is powered by a supplied DC power cord; the unit remains powered up when plugged in, as there is no On/Off switch. Along with the two sets of single-ended inputs is a pair of single-ended outputs. That’s it – no muss, no fuss! “Is impedance matching an issue? Passive volume controls do have to make a trade-off between input impedance and output impedance. If the input impedance is high, making the input to the volume control easy for the source to drive, then the output impedance is also high, possibly creating difficulty with the input impedance of the power amplifier. And vice versa: If your amplifier prefers low source impedance, then your signal source might have to look at low impedance in the volume control. This suggests the possibility of using a high quality buffer in conjunction with a volume control. A buffer is still an active circuit using tubes or transistors, but it has no voltage gain – it only interposes itself to make a low impedance into a high impedance, or vice versa. If you put a buffer in front of a volume control, the control’s low impedance looks like high impedance. If you put a buffer after a volume control, it makes the output impedance much lower. You can put buffers before and after a volume control if you want. With First Watt, you don’t just get a component, you get a Nelson Pass commentary and tutorial all in one. The B1 and J2 Owner’s Manuals read more like shoptalk to designers than directions for owners. Nelson attempts to make it lively by inserting analogies to explain the effect of gain in a system, such as driving a car at 55mph in a vehicle where the engine is barely working versus a car in which the engine is running at top speed. Vehicle analogies come in handy when discussing audio systems, and I can relate to this one. Having used everything from SET amps to high-power Class D, my ears have heard the sonic equivalent of what Nelson is saying. His assertion is that with the proper speakers the lower-powered amp can be every bit as stimulating to the hearer as the higher-powered. Staying with the automotive analogy, the question I will seek to answer is; does one obtain the full driving experience with lower power? Or, similar to a four cylinder car, does one hear a “strain” or lack of torque, so to speak, with a lower-powered amp? Conversely, does a higher-powered amp always ensure more ease, or shall we say, “sound performance”? The two camps, low power and high power, often do not compare directly technically as the technologies can be quite different – consider a SET amp versus a Class D amp. Yet, assuming there is no mismatch of the amp to speaker, the listening experience is the acid test for the hobbyist, and is the focus of this article. Just one question, do you feel having a bi-amped J2 has a clear advantage over single J2 ?